God bless the HP 8924C: without you poor college students would not be able to possess RF test equipment way above their pay grade. My model is the 60 W continuous version, US with green CRT. I was able to secure this wonder for $869 shipped from Washington to Boston, MA on eBay. It also seems like my purchase raised the price of these units on eBay by $200-$500. Sorry. Mine is in “Almost New” condition despite being over 17 years old. It originally retailed for $30,000. Pretty cool stuff. It cost more than cars back then. Some people on the internet (most everyone) will not know what the devil this is. It is, in fact, a service monitor. If you do know what that is, skip ahead to the tutorial section and avoid my sarcastic babble. I still don’t know what that means. Well you’ve come to the right place. A radio is a finely calibrated device, meant to operate on a portion of the electro-magnetic spectrum and not to interfere with others. There are many parameters on a radio that control its operation. These parameters must be adjusted to guarantee proper and legal operation of your radios. This device, in essence, is simply a very well calibrated device to which you calibrate other radios. How do you know this is calibrated? I just pray. If I were a real person, I’d pay the additional $500 to have someone take this finely calibrated machine and calibrate it by comparing it to an even more finely calibrated machine. Obviously I’m not. I did tune it to a local radio station (WXKS 107.9 mHz) and it was within a few Hz. I’ll take that as close enough when most of my radios vary by 500 kHz. But there must be more! 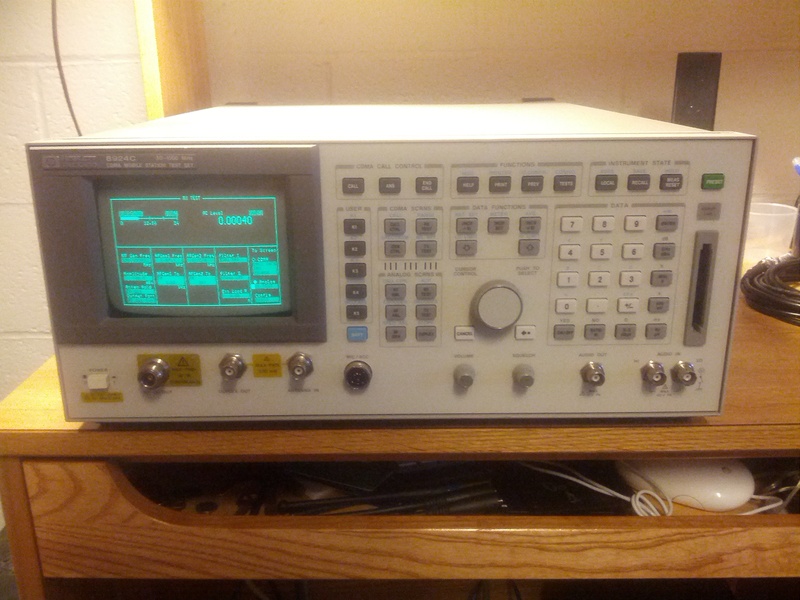 Furthermore, this device comes equipped with a spectrum analyzer (for viewing the RF spectrum VS amplitude on the screen), an oscilloscope (if you don’t know what that is…), an AF test set (to be used with the RF test set), and a Tracking Generator. This tracking generator seems cool. What is it? Oh and it also has Encode/Decode functions for many different signaling schemes (DTMF, and others that I haven’t played with yet). Well, you asked for it. (I understand you didn’t, but it’s my website.) To use the HP 8924C, simply press the power button. You should hear the sound of 10,000 war machine turbines spin up. This is entirely normal. The display will then illuminate after a beep, telling you (hopefully) that all self tests were passed. Eventually, you’ll be dumped to a screen involving RF test parameters. If you’ve configured it properly, you will see an analog screen. If you haven’t, you’ll be dropped to a screen dealing with CDMA stuff. As this was before the days of real computers, you control the thing by rotating a dial which moves a green blob around the screen. “Inverse Video Areas” are manipulable by moving the cursor up next and pressing inwards. Items with many numbers can be modified with the keypad in addition to the scroll wheel. Units can be adjusted with the abundance of ridiculous units keys. The easiest thing to do is to hit TX test under Analog SCRNS. This will turn the radio into a receiver. Then, key in your favorite FM radio station, attach a BNC antenna to the Antenna In port, turn the IF freq to 230Hz, turn the de-emphasis off, and rock out/party hard. The 8924C will display real time deviation parameters, as well as a TX frequency error (kinda cool, right?). If you drop on over to the SPEC ANL (hit the blue SHIFT and then RF GEN), you will see a mountain of lines. If you adjust this to the proper range (try .5 mHz), you should see a full mountain that constitutes your radio station. Hit SCOPE (again with SHIFT) and you’ll see the audio frequency plotted on an oscilloscope. Note that this is demodulated FM audio, not the RF itself. Kinda cool as well. So if you ever walk into your house and find one of these kicking around, feel free to turn it on and play! Below see the tracking generator looking at my Chinese Duplexer. The tuning is off by 3/4 of a Megahertz. That was rectified by my screw driver. Update: A reader has informed me that passive monitoring is not within this device’s capabilities. Alas. You have to pass through the RF through the duplexer. The RF comes out of duplex out on the 8924c and then passes through the duplexer (into the antenna and out of one side) and then passes back into the antenna in connector. You must switch to spectrum analyzer mode. Then through the menus you can adjust the center frequency and range of the displayed screen. I recommend something to the full range of the duplexer. When you’re ready to fine tune, you can then adjust the setting down. If you’ve done this correctly, you should see a graph similar to that above. Lower on the wave means more power gets through. Make sure you don’t screw up which end is higher/lower etc. Also, you should adjust the sensitivity and output power options of the tracking generator to properly see the full depth of the notch. You can then go ahead and adjust the duplexer until the frequency corresponds to your desired frequency at the maximum depth. Supposedly, proper use of this functionality requires a return loss bridge but I haven’t had any problems using it without. We got one a month and been trying to setup a duplexer and having problems. I tried to follow your info but got lost. Could you tell me the settings you have to have to get this done. I’ve updated the post. If you have further questions let me know. I don’t have the unit in front of me to verify menu settings, but that should be sufficient to get you started. Ah, a wonderful machine that can be had very reasonably due to the ignorance of others. It’s far more capable than many others out there many times the price on the used market. I absolutely love mine. It warms the room nicely in the winter too. Mine says last cal was 2004 but it’s still balls on. To get the 8924C into tracking generator mode… Rotate the cursor control knob to the “Analog” and select Spec Anl (Spectrum Analyzer). This is the spectrum analyzer screen and the fields are self explanatory. Move the cursor to “Main” and select it. You will now see choices on the lower right of the screen. To turn on the Tracking Generator, move the cursor to “RF Gen” and select it. The generate screen will appear with the spectrum analyzer. If you now move the cursor just below RF Gen, you can turn on the tracking generator. 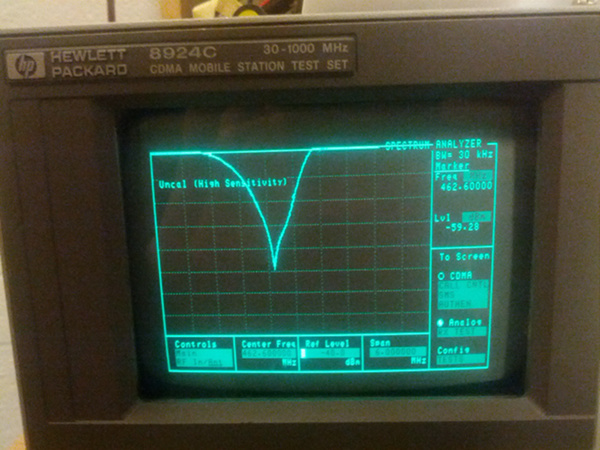 The 8924 will now output a swept RF generate signal that tracks the spectrum analyzer. Move the cursor back to “RF Gen” select it, then Move it to ‘Main” select it. You are now back on the Spectrum Analyzer display. Set the center frequency and span to your use and the 8924 will output a signal from the duplex port that will track the Spectrum screen. This is the typical setup to sweep and adjust tuned cavities / duplexers. In 2016 I bought a full HP8924C and would like to get a few more details on how to set duplexers with this equipment. Please! Tell me how many cables and connectors which must connect the duplexer? If you can post a picture of how to connect the cables in the duplexer and HP8924C using the tracking generator, I would greatly appreciate it. Hug and is at peace! Hey! It’s been a while since I did this, but basically you need to enable the tracking generator for the appropriate frequency range you want to tune for; then you select the appropriate ports (usually the two BNC connectors since you’re using low power). You want to test the performance of the duplexer as it will be used, so for the transmit frequency send the RF into the TX radio port and then measure the output at the antenna. For the RX put it into the antenna and then measure output at the RX terminal. Then you play the fun game of tuning all the little knobs to obtain optimal attenuation curves on the display.